Our listing on HomeAway provides you with the ability to see our map showing the location of our condo on the island. 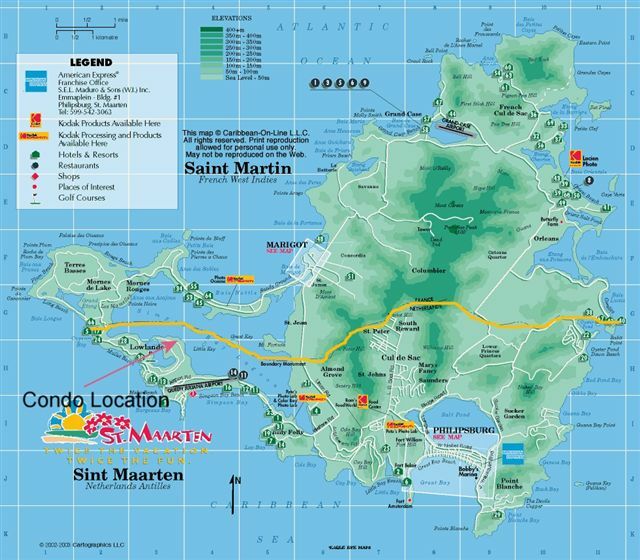 The map below provides an overview of the island of St. Martin/St. Maarten with an arrow showing the location of the condo. The yellow line dividing the island is the border between the French and Dutch side. There are no border controls and visitors can move freely between both sides. The US dollar is accepted on both sides of the island. Detailed driving instructions from the car rental site will be provided. The condo is a short drive from the airport and away from the flight path.